2017 marks a unique year indeed. It seems that not only was this year successful for the big-wigs in Hollywood with films like Get Out and IT, but also for the indie art-house directors with films like The Killing of A Sacred Deer and It Comes At Night. This year is also marked in controversy in which an abundance of horror films leaned more towards a dramatic approach as opposed to a straight up horror film. Either way, this year was absolutely another great year for horror, regardless of the slow crawl in the beginning. In the end I clocked in at 52 horror films and man, let me just say, it was tough compiling my list. 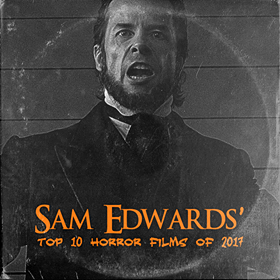 Without further ado, here is my top ten horror films of 2017 (with some honorable mentions).